UK Catamaran Racing Association (UKCRA) Catamaran charter boats all ready to go!!! 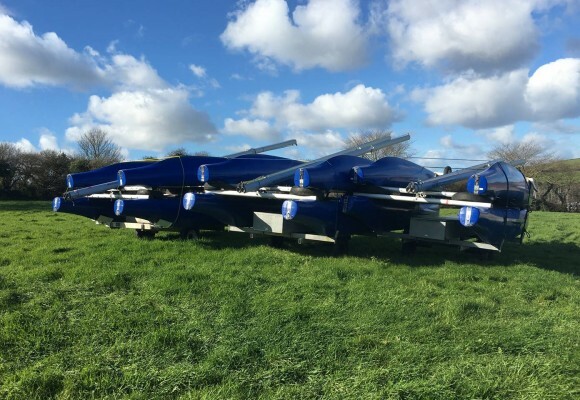 The 3 x sets of UKCRA catamaran charter boats are all prepared and ready to go to new homes for the 2016 sailing season. Each charter package of two boats , trolley and road trailer are fully serviced by the UKCRA sponsor Windsport before going out to a new club or organisation committed to running an introductory catamaran sailing program this season as a stepping stone to creating their own catamaran fleet or strengthening the catamaran fleets they currently race. This is the second year of the program, following great success in 2015 with young sailors using the charter program as a stepping stone to joining the UK Youth catamaran squad and others converting to club catamaran fleet racing. Our UKCRA charter boat sponsor Windsport, are well known in the catamaran world , for supporting UK catamaran sailing , providing training , coaching , replacement parts and technical support across the catamaran classes and we welcome their invaluable support. Andrew is the UKCRA Webmaster. A Tornado sailor and the founder at online chandlery Dinghy Rope.